ISLAMABAD - Pakistan and India traded fresh accusations of cross-border fire in Kashmir on Tuesday, a day after top officials discussed ways of de-escalating tensions over the disputed Himalayan region. Lt. Col. Manish Mehta, an Indian army spokesman, said Pakistani soldiers fired mortars at Indian army positions. 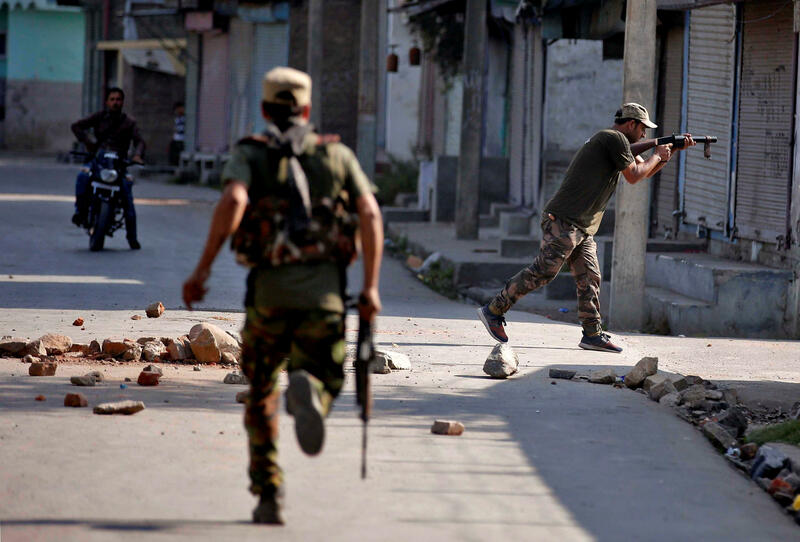 Indian soldiers “appropriately responded to the unprovoked cease-fire violations,” he said. The Pakistani military said its troops responded to “unprovoked” Indian fire, which continued for two hours. Pakistani National Security Adviser Nasser Khan Janjua briefly spoke with his Indian counterpart Ajit Doval on Monday, three officials in Islamabad said, the first such high-level contact in weeks. The three officials, including a close aide to Prime Minister Nawaz Sharif, spoke on condition of anonymity because they were not authorized to brief media. Tensions have soared between the two nuclear-armed rivals since a Sept. 18 militant attack in Kashmir that killed 19 Indian soldiers. The mountainous region is divided between Indian and Pakistani-controlled zones, but both countries claim Kashmir in its entirety and have fought two wars over it. The Indian army said last week that a “surgical strike” had destroyed “terrorist launching pads” used by Pakistan-backed militants. Islamabad rejected the Indian account, saying cross-border fire killed two Pakistani soldiers. Pakistan says it extends moral and diplomatic support to Kashmir militants but denies India’s accusations that it arms and trains them. A government statement released after the meeting said Pakistan was “effectively fighting terrorism and has made phenomenal progress in the war against terrorism,” but that heightened tensions with India could shift its focus. The two sides have exchanged several rounds of fire over the past week. Five civilians were wounded by cross-border fire on Monday. No casualties were reported from Tuesday’s exchange.